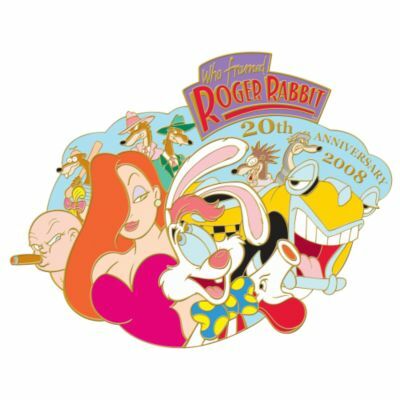 This pin was released in 2008 to celebrate Who Framed Roger Rabbit's 20th Anniversary. The cartoon cast of the movie are here - Roger, Jessica, Baby Herman, the five weasels, Benny the Cab and the squeaking shoe. The blue background is a pearly blue fill. Sadly, this pin has been counterfeited so please be aware when buying or trading.